(e.g. Putting all your price options for adults in to one Payment Plan allows you to send a trigger just to members using that plan that you can address “Dear Member Name”, instead of Dear Parent/Guardian of Member Name). Go to Payment Plans for more detailed instructions. How to limit the amount of prices that are displayed when booking (helps to reduce user error). Choose whether this price is available to your members online. 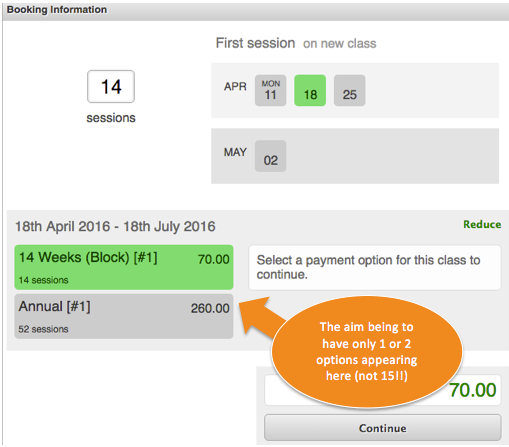 Choose how many sessions a member can buy with this option. You can choose more than one number, i.e. 6, 12, 18 sessions). Leave blank if using Fixed End Date as CoursePro calculates how many sessions are in the term. Enter the price PER session (class). CoursePro can also handle a price change at a specific date, just add an end date to your current price and add a new price with a start date. You can specify that a price is only available in a region, at certain centres, on particular courses or only at certain levels. For example, if you run different centres that have different prices or Stage 8, 9 and 10 are more expensive. In the Size Constraints Section, you can specify that this price is only available to classes with a certain capacity. For example, 1 to 1s, 2 to 1s or maybe you have classes with a maximum of 4 members that are more expensive than the ones with 8. You can make a price depend on the duration of the class in the Duration Constraints Section. For example, 30 minute classes and 60 minute classes having different prices. You can ensure that a price only appears for certain members by using memberships. This is useful if you have member and non-member prices. 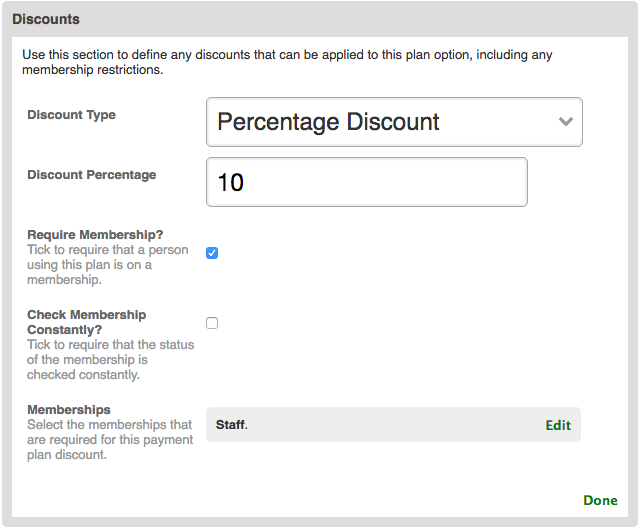 Do you offer staff discounts? Maybe sibling discounts? You can also add a membership to a discount to ensure it’s only available to certain members. In the example (above), staff get a 10% discount.